If you drive today in Dinetah, you will see a pattern emerging among the various homesteads that you pass. Often, there will be a trailer, a brush shelter called a ramadah used for shade in the summer heat, and a six-sided structure whose doorway always faces to the East. Sometimes the structure is cone shaped rather than round. This is the Navajo hogan, the traditional dwelling place for Navajo families and center of religious ceremonies. In the last few decades the hogan has lost its prominence as the primary dwelling place, and most families live in trailers or small houses and maintain a hogan for ritual puposes only. Whether or not the hogan is in daily use, it still retains its ritual importance. First Man made the first hogan, providing the model after which every other hogan is taken. Building a hogan, therefore, becomes an act of ritual recreation and must be accompanied by the requisite speech and songs. The poles of the first hogan were made of "jewels, white shell, turquiose, abalone, and jet" (Wyman 11). The framework was constructed out of four named poles: the southpole was called the pole of Mountain Woman, the west pole was called the pole of Water Woman, and that of the north the pole of Corn Woman (11). The top of the hogan was a rainbow. While the hogan was constructed, chief or planning songs were sung and the first "no-sleep" ceremonial was held, which "established the hogan as a place of worship for the Blessingway and other future ceremonial" (11). Blessingway is vastly concerned with the hogan, a term which has been anglicized from Navajo hooghan, the place home. This place home is to be the center of every blessing in life: happy births, the home of one's children, the center of weddings, the center where good health, property, increase in crops and livestock originate, where old age, the goal in life, will visit regularly. The Blessingway is the "main stalk" of the Dine' religious system, and every Blessingway begins with one of two sets of hogan songs. The first set, or chief hogan songs, "connote both the plan of and the mandate for the hogan" (Wyman 14). The other set is known as Talking God's hogan songs and were introduced during the second ceremonial held for Changing Woman (15). The hogan songs are discussed further in the Blessingway section. The hogan is built in the manner of this harmony. The roof is in the likeness of the sky. The walls are in the likeness of the Navajo's surroundings: the upward position of the mountains, hills, and trees. and the floor is ever in touch with "the earth mother." The hogan is a sacred dwelling. It is the shelter of the people of the earth, a protection, a home, and a refuge. Because of the harmony in which the hogan is built, the family can be together to endure hardships and grow as a part of the harmony between the Sacred Mountains, under the care of 'Mother Earth' and 'Father Sky' (Louis 1975:3 qtd in Griffin-Pierce 94). The earliest hogan was a conical or forked pole hogan whose frame consists of three interlocking forked poles and a fourth pole leaned against the others. The second, and more popular hogan is the round variety, which allows more living space becuase its size "is not limited by the length of available poles" (Wyman 11) (See opening image for a good example). The hogan songs reveal the proper method in which a hogan is to be constructed, The "east pole is to be picked up first and laid in position for convenient handling, the south is next, then the west, and finally the north pole" (Wyman 13). The poles are interlocked, leaving sufficient room for a smokehole and entrance and the open spaces are silled with soil, sticks, and bark (13). Then "two stone slabs are imbedded in the ground next to the "east pole." The stone slabs are neither necessary for the orientation nor soundness of the structure; instead, they become metonyms for the hogan itself, representing the continuity of the sacred hogan form which outlasts wood and other perishables (14). Many Dine' assert that the four sacred mountains form a hogan which contains the world of the Dine'. In terms of literal allegory, Gobernador Knob, the place where Changing Woman was found as a baby, is "representative of the conical hogan," while Huerfano Mountain is compared to the round hogan (Wyman 13). 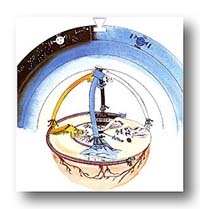 The four sacred mountains as a hogan form a closed system in which the Dine live; they remain inside the system, living within their own hogans which are a microcosm of the larger "mountain" hogan, which in turn is a replica of the first hogan that First Man created shortly after Emergence into the Fifth (or Fourth) world. Dine who remain inside the boundaries formed by the four sacred mountains can create medicine bundles, hogans, and practice the Blessingway ceremony in a way that Dine outside of the sacred mountains cannot. 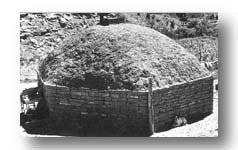 The supports for the hogan mirror the foundations of Navajo life. Farella asserts, "Just as the main poles of the hogan are raised, so will supports for the Navajo world and the Navajo way of life be placed. Those beings of the four directions will include the mountains which support the Sky, the roof of this world, and they will include the light phenomena of the cardinal directions qhoe Re the immediate "energy source" for animate beings on the earth's surface. Without them there would be no animation (giving birth) or reanimation (as in the ceremonies). In short, they are the main poles for, or the supports of, the Navajo way of life" (Farella 48). In a way, the mountains are an abstract manifestation of shima', or motherhood, a very important theme in Dine culture which is discussed at length in Changing Woman: Myth, Metaphor, and Pragmatics. Changing Woman is the Earth Mother and no discussion of land can be complete without examining her role in Dine culture.